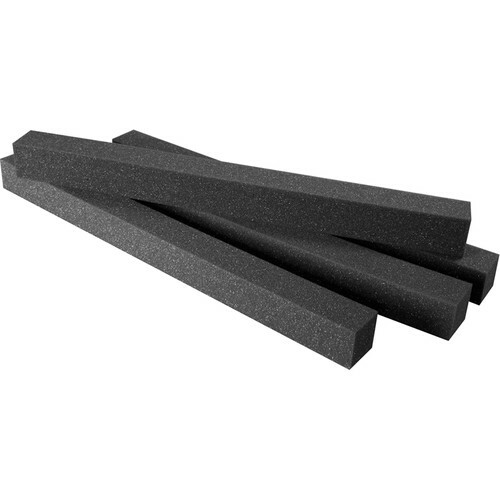 The 4-pack of Ultimate Acoustics Acoustic Foam Edging is an ideal compliment to your acoustic treatment installation. This acoustic foam edging defines clean lines in corners of rooms where walls meet walls and walls meet ceilings, providing an edge for acoustic treatment to be installed next to. They also help control low energy that tends to gather in the very same corners of rooms. The acoustic foam edging comes in 2"x2"x24" sections and ships in packages of four units. Box Dimensions (LxWxH) 24.0 x 8.0 x 2.0"
Acoustic Foam Edging (4-Pack) is rated 5.0 out of 5 by 1. Rated 5 out of 5 by Anonymous from Surprised at how effective they are I installed these in the corners of the four walls of the room I'm treating for voiceover work. I was surprised at how much absorption these edge pieces are capable of. They aren't going to be enough on their own, but they will dramatically reduce the amount of additional work needed when used in conjunction with other acoustic panels.